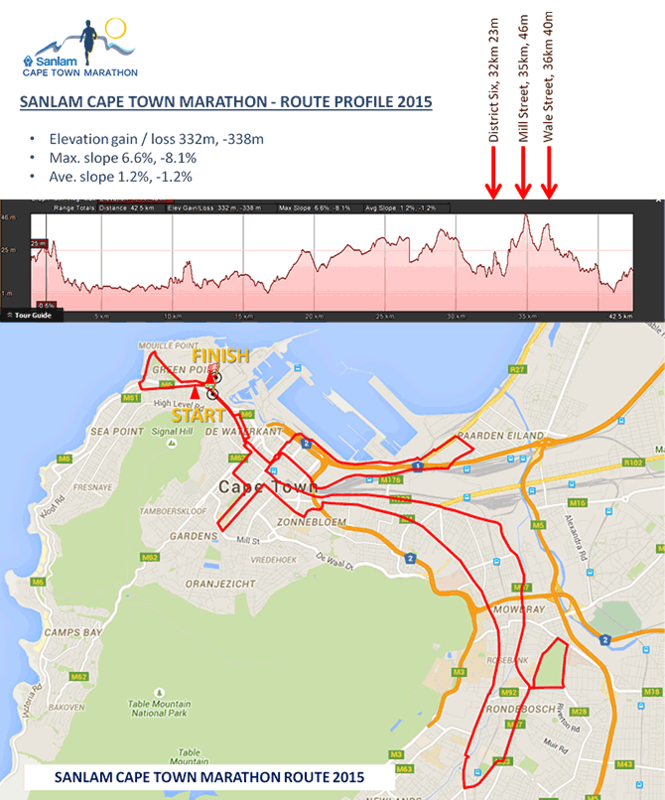 Sanlam Cape Town Marathon is staged over 2 days – 19-20 September 2015. The main event is the 42.2km Marathon on Sunday 20th September starting at 07:00, starting from Helen Suzman Blvd and Vlei RD intersection in Green Point Cape Town with a cut off time of 7 hours. The event is open to elite athletes, runners that are registered or not and wheelchair racers over 20 years old. With Prizes on offer being more than R1.95 Million for the events. For all the race information click here. For all the detail on the 42.2km marathon and the race rules pdf. Also run on Sunday 20th September starting at 06:50 will be an international 10km PEACE RUN, which is open to all runners on a flat and fast route, of the Atlantic seaboard. By running this event you will experience the spirit of the Cape Town. This event will have a 2 hour cut off time and start and finish at the Green Point A track, Cape Town. For more info click here. While you’re Cape Town… you could do the Peace trail 22km or 11km on Saturday 19th September, Starting 07:00 from Somerset Road in Greenpoint and finishing at Greenpoint A track with a cut off time of 4.5hours. You will enjoy stunning city and iconic Table Mountain vistas from the slopes of Signal Hill, as well as breath taking views over the sweeping Atlantic Ocean from the contour path on Lion’s Head before making the descent to finish at Green Point Stadium. The 11km starts after the 22km at 07:45 running the similar route but shorter. Then at 10:00 to make sure no families are missed out on the action, there will be high-spirited 4.2km Fun Run is a community-building event that opens the race track to all. It’s the opportunity for families and friends; business, school and other community groups to band together and enjoy being part of one of Africa’s most prestigious athletic events. With the vision being driven by 2 of South Africa’s celebrated sport people, Francois Pienaar and Elana Meyer. It look like a great weekend out to spend in the mother city. For all the information on the Sanlam Cape Town Marathon, check out the website. If you need a car or a van to get around Cape Town for that weekend, CABS Car Hire will be of service to help.